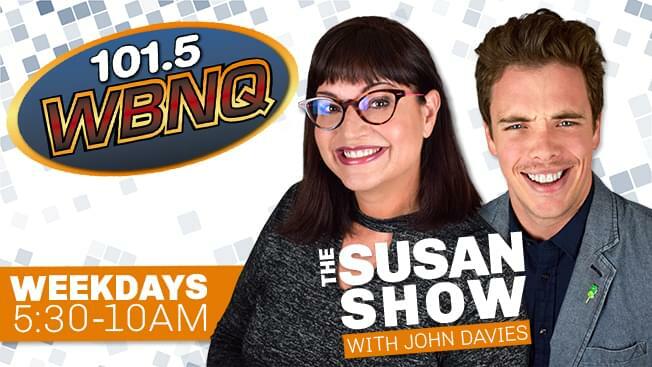 Join Susan Saunders each weekday morning on WBNQ. Get your funny on, win prizes and hear a great mix of all the hits! The WBNQ morning show delivers what you need to start your day in Central Illinois. Call 309-828-1015 to join in the fun on air, or email Susan@wbnq.com. Live and local, the way it should be. I have been working in radio for over 25 years now, (yes, I started in high school–no lie) and I have worked all over this fine country including long stays in Madison, Rockford, Sacramento,Chicago and for the past 20 years here in Bloomington Illinois at WBNQ. Born and raised on a small farm in Rochelle Illinois, I trained and competed in all the yummy music programs, theater, and speech team from birth through my college years at Northern Illinois University. Radio became the launch pad for so many performance opportunities that I just couldn’t let it go. Before I realized it, I was a broadcaster first, and everything else second. Happily married to Derek, who did indeed catch my eye on Match.com over 10 years ago. We live just outside of Bloomington in a home that we built with our own two hands. Inside we share it with two cats that love to play fetch, and we are avid RV campers who love the smell of bug repellent. As to the most commonly asked question: “Why stay in Bloomington so long?” Ahh the joys of living in a smaller city and working with great radio people.You can’t beat that. Plus, WBNQ was one of the first stations in the country to allow a woman(me) to lead their morning show, and for that I am very grateful. Being live and local is always my top radio goal, but being Arbitron ranked number one on the number one rated station has been tasty icing on the cake. Find me on Twitter @wbnqsusan , Facebook, and @susansaundersradio on Instagram! John or “Davies” was born and raised in the greater Cincinnati area, originally born five minutes outside of downtown in Northern Kentucky. He moved to Bloomington in the Fall of 2018 to join The Susan Show. Before his move he spent 5+ years with Cincinnati’s WKRQ and WUBE. After spending years in the spot light, studying vocal performance, he decided he’d rather talk about the music rather than perform it. In his spare time Davies finds time for live music, his love for Chelsea football club & the English Three Lions (both soccer teams), and the never ending quest to find the world’s greatest Margarita. His ideal vacation consists of a weekend at Bonnaroo with all of his closest friends and his phone in airplane mode. End game you ask? My lifelong dream has been to become a game show host. Until then, I’ll see you weekday mornings at 5:30 on WBNQ’s The Susan Show!